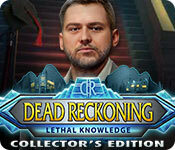 Hunt for Hidden Objects, find clues and solve puzzles in the popular Dead Reckoning series! Try before you buy! Can you catch a murderer that’s terrorizing a local university?